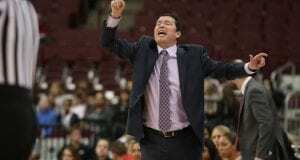 On Friday, the Ohio State women’s basketball team begins its trek toward the program’s first Big Ten tournament championship since the 2010 season. The team heads to Indianapolis as the No. 1 seed in the tournament and riding an 11-game winning streak. The Buckeyes (25-5, 15-1 Big Ten) have momentum in their favor, recently upsetting the then-No. 2 Maryland and winning a share of the regular-season titles. Adding to that, six players received All-Big Ten awards, including junior guard Kelsey Mitchell, who was awarded Big Ten Player of the Year. Coach Kevin McGuff said OSU’s depth might be an advantage as the team heads into the Big Ten tournament. Given the nature of one-and-done tournaments, there’s an element of unpredictability in a team’s schedule and opponents. In practice, OSU has put focus on its own style of play rather than the teams it might potentially play. For all the teams in the Big Ten tournament, it is win or go home, and two-time Big Ten Player of the Year Mitchell has thrived in those scenarios. In her five career Big Ten tournament games, she has averaged 30.4 points, 5.8 rebounds and 3.2 assists per game. The Buckeyes have another player that has been playing exceptionally as of late. 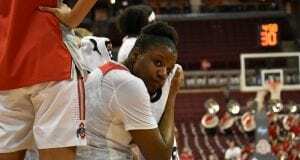 Senior forward Shayla Cooper has helped to fill the role of junior forward Stephanie Mavunga, who was the Big Ten’s leading rebounder and the team’s second leading scorer when she went down with her right-foot injury. Cooper has averaged 15 ppg, 8.3 rpg, and 3.5 asp since Mavunga’s injury. 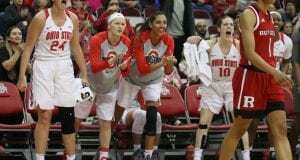 OSU’s first game will be against the winner of Northwestern and Iowa on Friday at noon. The Buckeyes are expected to play Saturday at 4 p.m., and Sunday in the championship at 7 p.m. if OSU wins their respective games.